Even today, Patek Philippe’s extraordinary care and commitment towards perfection means it takes almost year to manufacture even its simplest watch movement. – 1839 Antoine Patek began producing about 200 high-quality pocket watches per year. – 1845 Patek & Co. Partnership founded in Geneva with Jean Adrien Philippe, Technical Director. – 1846 Tiffany & Co. New York, Tiffany appoints Patek Philippe as its principal supplier of pocket watches. – 1857 Universal Exposition, London, Queen Victoria and Prince Albert buy a timepiece, shooting Patek to international fame. – 1867 the company produces the world’s first wristwatch. – 1927 the company produces the world’s first perpetual calendar wristwatch. – 1941 the company produces the world’s first perpetual calendar chronograph wristwatch. – 1962 the company produces the world’s first automatic, perpetual calendar wristwatch. It is said that fewer than 1 million Patek Philippe watches have been made since the first watch was completed in 1839. That is fewer than some high-end Swiss manufacturers (notably Rolex) produce in one year. In fact, the company limits itself to producing less than 50,000 watches per year, even though it is estimated by watch market analysts, the company could sell ten times this figure. Patek production is so detailed, it takes almost a year to complete its most basic watch and more than two years to produce some of the more complicated timepieces. Patek’s vintage complications hold more world record prices at auction than any other brand. Landmark models include the model ref. 1518, the world’s first serially produced perpetual calendar chronograph, and its successor, the Ref. 2499. Other famous models include perpetual calendars such as the ref. 1526, ref. 3448 and 3450. We, of course, associate Patek Philippe with the very best, but more particularly, understated elegance, craftsmanship, heritage, exquisite design, perfection and total confidence and commitment in everything it does. Anyone with more than a passing interest in vintage Patek Philippe will know that a 1940s model, particularly over 33mm, is exceptionally rare. Indeed, these are seldom seen outside the high-end collector/auction market. The model ref 1491, known as the ‘Riccio’ is especially coveted by collectors for its scroll lugs, which are the calling card of this model. First released in 1940, it remained Patek’s most exclusive dress watch until production ceased in 1958. The reference 1491 is almost always found in yellow gold, rather than the pink gold example we see here. Experts find it difficult to be precise, but fewer than 20%, and perhaps even as few as 1 in 10, were produced in pink gold. The few examples which do come to market would certainly seem to bear this out. It may or may not be of note, or of passing interest, that very recently on 22nd March 2019, a Patek Model Ref 1491 was sold by Christies for $591,000 USD – admittedly a chronograph, and probably unique! This stunning dial in Ivory Cream is furnished with applied pink gold pencil hour indices. The wonderful original pink gold Dauphine hands, indices, and outer minutes register contrast beautifully with the Ivory Cream dial, as does the rest of the watch case. Patek dials are usually very simple and often even quite sparse, however here it is a lot more interesting. The outer minutes register picked out in pink gold, in keeping with the overall design of the watch is quite bold, but overall, the dial is exquisitely executed with a perfectly proportioned subsidiary seconds dial, supported between the five and seven, hour indices. The centre of the subsidiary seconds dial is very finely, concentrically ringed, which is more apparent in reality than is evident in the photographs. The ‘seconds’ register is printed in black, as is the Patek Philippe Geneve signature and ‘Swiss’, at six. This is the original dial which has been beautifully restored by our dial restorers, who are considered to be the best in the UK. Please note, even though our photographer has done excellent work, the dial looks much better in real life. Some may be surprised that Patek Philippe almost did not survive the Great Depression and Wall Street crash of the early 1930s. Fortunately, the company was saved by the Swiss, Stern family, which still owns the company today. One of Charles Stern’s early important decisions as Chairman, was to cease the practice of buying in movements from Jaeger-LeCoultre for its Calatrava collection, introduced earlier in 1932. This is important because the Patek Calibre 12-120 movement we see here was the direct result of this decision. Indeed, it was the first Patek Philippe movement fitted in the Calatrava, which subsequently became its most successful line of watches ever. The Calibre 12-120 is one of two versions, the 12-120 with the subsidiary seconds dial as seen here, and the 12-400 with a centre seconds design. The movement has 18 Jewels, a Breguet hairspring and a power reserve of 44 hrs. As can be seen, this movement is in spectacular condition. The Geneva wave finishing on the bridge and plates and the bevelled edging throughout was all applied by hand, 70 years ago, and looks as beautifully bright and fresh today as one could ever wish. This movement is in A1 condition indicating this watch has been properly cared for and regularly serviced. The movement has been fully overhauled and serviced by a Master Watchmaker. This means dismantling the movement to all its component parts, careful inspection under high magnification, replacement where necessary with only genuine parts, then careful reassembly and adjustment, before final calibration in 5 positions. The movement winds, sets and runs accurately and reliably and at final testing and calibration, it was running within +3 seconds per day, averaged over 5 positions. This is outstanding for any watch of this age. We are therefore highly confident in offering a 12-month warranty with this watch movement*. The movement is all correctly signed, Patek Philippe & Co, Geneve and Swiss, with the Calibre number 12-120 and the movement serial number 963,243 which dates this watch to 1948. As can be seen in the photographs, the Patek Philippe extract from the archives, applied for and included in the sale, indicates this watch was first sold on March 14th 1949 so this watch could equally be described as a 1948 or a 1949 watch. This could make it a perfect 70th birthday present! Patek demonstrated a remarkable and somewhat uncharacteristic lack of restraint in releasing the model reference 1491 in 1940. Obviously aiming for the higher end of its already exclusive market, the elegant flying Scroll lugs might almost be described as flamboyant, compared to its more usual reserved, conservative standards. Carried in their own frame, applied to the case, the aesthetics of the design in anything other than the most expert hands could easily have been unsuccessful. But here we think they are a triumph and add great distinction to an already distinctive watch. The case is notable not only for its curly Scroll lugs, but also for the impressive pinkness of its gold. 18ct pink gold is an alloy comprising of 75% pure gold, mixed with mainly silver and copper. Depending on the precise mix of silver and copper and other trace metals, pink gold can range anywhere between a coppery red, through pink, to almost yellow gold. Quite how Patek achieved this level pinkness here will perhaps remain a secret. The 34mm in diameter, excluding the Patek Philippe signed crown, is large for the period and certainly for a Patek Philippe dress watch. In fact, only its’ chronographs were larger. The lugs also elongate the watch considerably, measuring 43mm overall, tip to tip, making the watch seem larger than 34mm on the wrist. The condition of the three-piece case is outstanding, indicating the watch has seen only very light use and proper care. It is as sturdy and tight as the day it was made, with all parts pressing together with a very firm click. There are no scratches or other marks, or signs of wear visible to the naked eye. Inside the case, the case-back is all is signed correctly and as expected: Patek Philippe & Co, Geneve, Swiss, with Swiss 18ct hallmarks, the case serial number 652,328 and the Patek Philippe model reference number 1491. The watch is fitted with an original, lightly worn Patek Philippe Dark Brown Alligator strap, with the original Patek Philippe solid 18ct pink gold buckle. As shown, an original Patek Philippe ‘Extract from the Archives’ is included with the watch showing all the reference numbers, markings, signatures and hallmarks are all correct, and dating its’ manufacture to 1948. It also shows the first date of sale as March 14th 1949. This watch could therefore equally be dated 1948 or 1949 and so it could, perhaps, make the perfect 70th birthday present! Our detailed Particulars document will be included with the receipt, along with our 12 months’ warranty*. A separate insurance valuation for the replacement value of this watch will also be provided at the time of sale, along with our unique ‘Lifetime Authenticity Guarantee, which states: “If this watch proves to be anything less than totally authentic, or not as described, Vintage Gold Watches of London will offer you a full refund at any time”. This watch comes complete with a high-quality hardwood presentation box as shown. 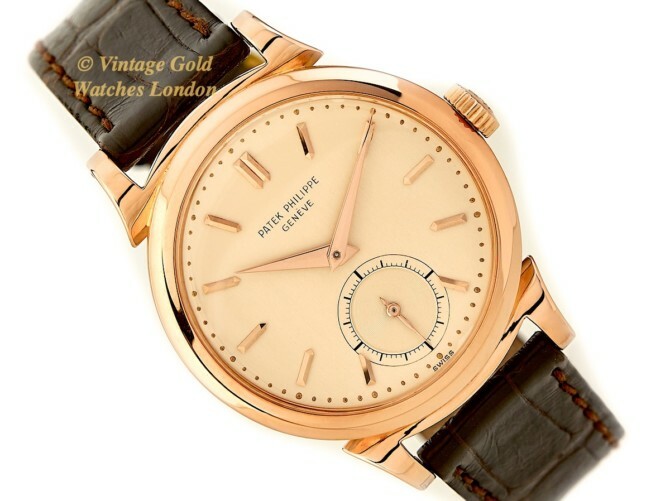 Note: As mentioned above, this 18ct Pink Gold Patek Philippe, model ref 1491, is a truly rare watch. Therefore if you would like to buy it and you have the means, please don’t pass up the opportunity, as we are very unlikely to see another. There is an 18ct Yellow Gold example of the ref 1491 currently listed with another UK dealer outside of London, at £18,000, So by comparison, we our price is very fair. Here we have a truly rare and highly sought-after, vintage gold dress watch from horology’s most revered name. It is truly a thing of beauty – to wear, use, treasure and enjoy. It will also make an excellent investment and family heirloom piece. Even though Patek prices continue to rise inexorably, we feel outstanding examples such as this remain undervalued, particularly when compared to a new Patek Philippe. As each year goes by and the world market for vintage Patek Philippe watches expands, availability will become ever more limited, meaning prices are destined only to climb ever higher! A word about our prices – We always try our hardest to acquire the very highest quality watches we can find, before restoring these to the highest possible standards. We then offer these at the fairest prices we can, taking into account our pre and post sales care and service. This approach inevitably means we will never be the cheapest, but nor will we be the most expensive. Indeed there are many well-known stores in West London which are very successful charging between two to three times our prices. We therefore consider our prices to be very fair, given the quality of watches we have to offer. We are happy to accept PayPal as this is the quickest method of payment. However, if you would wish to pay by bank transfer, we will be pleased to pass on a 3% transaction saving to you. Similarly, if you wish to pay by International SWIFT or International Bank Wire Transfer, we will provide you with our BIC / Swift number and our IBAN number. Please note, we also welcome part exchanges and offers of watches for sale. If you have any questions please call UK 0207 727 7095 or International +44 207 727 7095.